Honda NC750S lowering kits from LUST Racing. 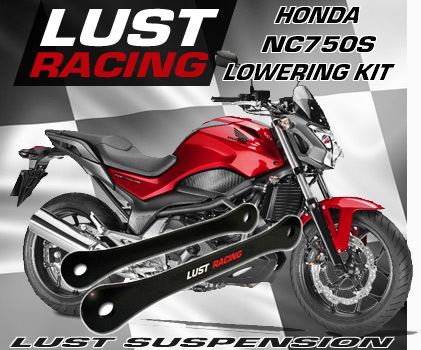 Now you can reduce the seat height of your Honda NC750S by installing a suspenison lowering kit from LUST Racing. If you find your bike to tall and struggle to reach to the ground a lowering kit will resolve the issue. Choose 40mm (1.6"inch) or 30mm (1.2"inch) lowering. LUST Racing lowering kits are made in roll forged steel and are stronger than the standard parts replaced. Finsihed in black powder coating which gives excellent corrosion protection and a finish pleasant to the eye. LUST Racing logo in red and chrome. Will fit all Honda NC750S models from year 2014-2019, with or without DCT and ABS. LUST Racing lowering kits comes with model specific installation instructions.